God’s love immeasurable, and by following Him, in the Eucharist, we make our own life a gift. These were some of the reflections made by Pope Francis during his weekly Angelus address this Sunday. Speaking to the crowds, which nearly filled Saint Peter’s Square on the hot July morning, the Pope focused on the feast of the Most Holy Body and Blood of Christ – or Corpus Christi – celebrated in many parishes this Sunday. The Gospel reading for this feast is taken from John, and focusses on Christ’s discourse on the “Bread of Life” which He delivered in the synagogue at Capernaum. Pope Francis went on to say that each time we take part in Mass and are nourished by the Body of Christ, “the presence of Jesus and the Holy Spirit acts in us, shapes our heart,” and speaks interiorly to us in a way that shapes our behavior according to the Gospel. “The charity of Christ, welcomed with an open heart, changes us, transforms us, makes us able to love, not according to human measure [which is] always limited, but according to the measure of God,” which is without limits. “One cannot measure the Love of God,” he said. 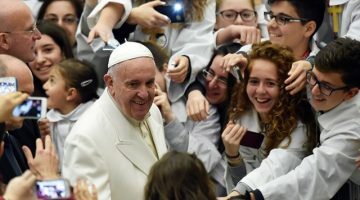 In this way, we become able to love those who do not love us – which, the Pope said, is not an easy thing to do – and to confront evil with goodness, to forgive others, to share, and to welcome. By living in this way, the Holy Father said, “we discover the true joy” of giving back the great gift, which we, without merit, first received ourselves. “This is beautiful,” he said: “our life becomes a gift!” This is an imitation of Jesus. After reciting the Angelus prayer in Latin, Pope Francis recalled that 26 June is the United Nations International Day in support of victims of torture . 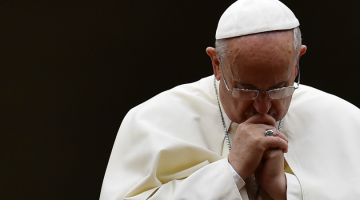 Saying that every form of torture is a “very grave sin,” the Pope invited Christians to commit themselves to its abolishment, and to offer their support for its victims and their families. Finally, after greeting the many other pilgrims and local Italians who had gathered in Saint Peter’s Square, the Pope wished everyone a good Sunday, and asked for their prayers.